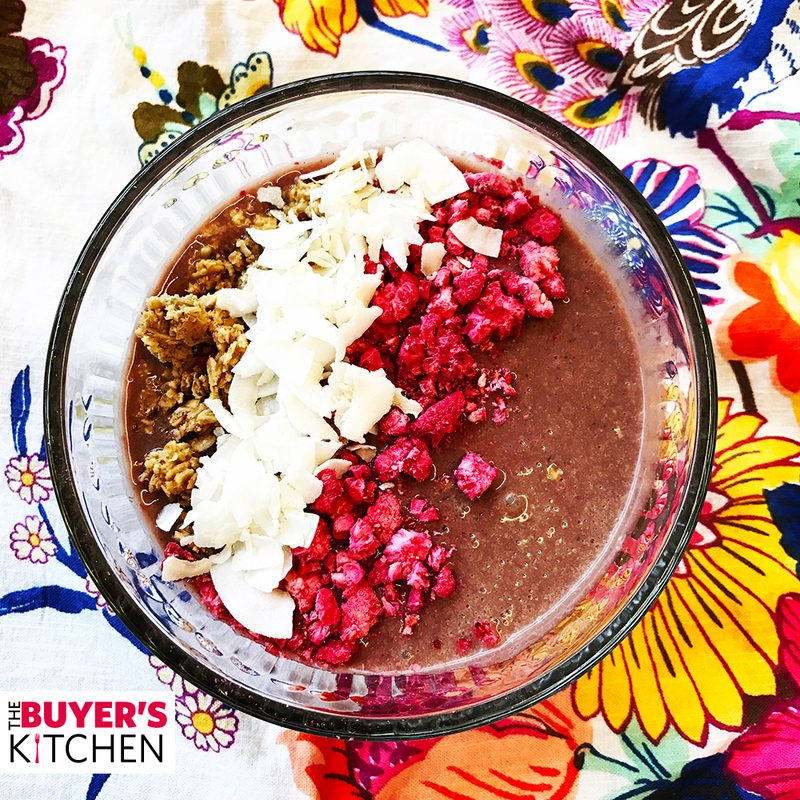 Smoothie bowls have been making the blogging rounds as a fun new approach to breakfast. Basically, you make a smoothie, put it in a bowl, and put stuff on top of it. Stirred together, the smoothie bowl has more texture and interest than a basic smoothie, and since you’re (probably) sitting down to eat it, you can take your time to really enjoy it, rather than just slurping it down. All the convenience and health benefits of a smoothie, but a lot more fun. We decided to try it by making our own. Acai is a super fruit with a lot of antioxidants. We used it as our base along with banana and protein powder (to keep you full ’til lunch time), blended with almond milk, then topped with some fun ingredients. 1 pouch Acai – Acai Roots Pure Acai Organic Smoothie pouches, 14 oz (4 pouches), Our Price: $3.99, Elsewhere: $7.99 – Save 50%!1 cup Almond Milk – Pacific Organic Vanilla Almond Milk, 32 oz, Our price: $1.49, Elsewhere: $3.99 – Save 63%! Granola – Cascadian Farm Oats & Honey Granola, 48.5 oz, Our Price: $3.99, Elsewhere: $7.99 – Save 50%! Put contents of frozen acai pack into the blender. Add banana, almond milk, and protein powder, and blend until smooth. Pour blended mixture into a bowl. Top with chopped raspberries, coconut, and granola. Stir to combine, and enjoy!